Ljubljana, harmonica: 7. 7. - 11. 7. Vladimir Hrovat completed violin studies and for the most of the years of his violin career had been employed as a member of the Slovene National Radio-Television Symphony Orchestra. In addition to the violin he plays a number of other instruments too (accordion, tenor-banjo, bass-guitar etc. 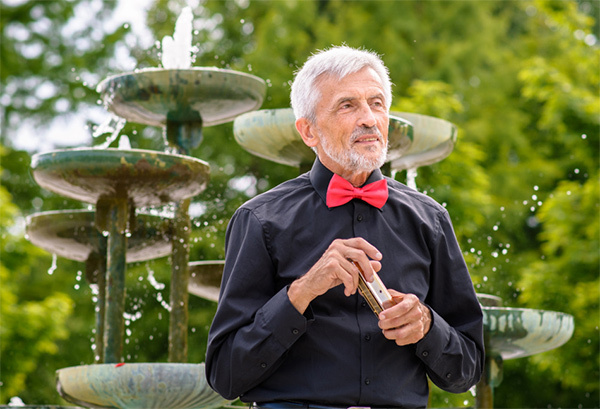 ), appearing most often as a classical concert soloist on the mandolin and above all with his special love - the harmonica. His solo work includes numerous concert appearances as well as audio and video recordings accompanied by the international recognized artists, and frequently by the symphony orchestra. All this he completed till now with his own four CD's published by the national Radio-television Slovenia house production. Hrovat is a member of Society of Slovene Composers, and many of compositions from his wide palette of varied choral, soloist, chamber and orchestral music have won awards and have been published and performed in Slovenia and abroad as well.